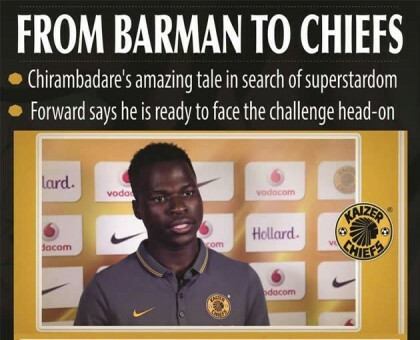 KAIZER Chiefs’ newboy Edmore Chirambadare has revealed that five years ago he was forced to dump his football career and worked as a barman in Gweru before returning to the game where his determination has seen him scale the heights of signing for South Africa’s most glamorous club. The Zimbabwe international is one of the players to have arrived at Amakhosi ahead of the 2016-17 South African season, with the forward signing from Castle Lager Premiership champions Chicken Inn along with fellow striker Michelle Katsvairo. But, as he recently revealed to top selling South African soccer magazine KickOff, Chirambadare had for six months in 2011 turned his back on the game after being frustrated at Central Region Lower Division side ZimAlloys. Just five years ago, Chirambadare was so disillusioned with football that he quit and worked as a barman for six months back in his hometown of Gweru. It is against this background that he views his big move to Chiefs as somewhat a miracle. Chirambadare had been with ZimAlloys when he was forced to take his break from the game after being overlooked by his coach at the time. “For me it is a huge miracle” he said of his move to Chiefs. “I say so because this is a big team and people are surprised that someone like me would find himself at such a team. Even my mom didn’t believe that her son would get to such a stage in his career. “She just thought I was playing because I liked it and not to make a career that could take me to this kind of stage. Considering where I started off, this is really a huge miracle,” Chirambadare said. Given that Chiefs’ signings from here are usually greeted with suspicion by those not familiar with Zimbabwean football, Chirambadare knows they will be under scrutiny from the Soweto giants’ demanding fans. Chirambadare was, however, quick to acknowledge that expectations are high at Chiefs, especially given the Soweto giants are looking to put a difficult season behind them. “In football there is always pressure. As a player you must just get used to it because the pressure from the fans is all down to the fact that they are there to support the team and they want us to win. “All you should think about is delivering the results for the fans to be happy”. The forward is looking to follow Musona’s footsteps and just like the “Smiling Assassin”, he can play wide or as a support striker. “I hope to emulate Musona because he did well here and scored goals. When you score goals everyone warms up to you faster,” says Chirambadare. Nicknamed “Spanner”, Chirambadare hopes to fix part of the problem that stung Chiefs for most of the past season. “I know that it is difficult to score when you play as a left winger, but I will try my best. In this team I will be creative and try to play to the best of my ability, seeing that I am also capable of playing as a second striker. “What matters most is that I am a footballer and I will do my talking on the field. There is no need for me to be making noise about myself, but what I promise is that Chiefs fans should look forward to something good from me. “Even my mom didn’t believe that her son would get to such a stage in his career’’. Before getting the big break to join Chiefs, Chirambadare had been on trial at Bidvest Wits at the beginning of last season. “I trained for a week with them. When they were supposed to go for a pre-season camp somewhere, I was wanted back home by my club who had an important game to play. I then went back home and if truth be told, nothing was ever really made clear. Chirambadare also told the magazine that he actually signed for Chiefs well before the end of last season after being spotted during a Champions League match at the beginning of the year. “It all started after the game we played against Sundowns in Pretoria in the CAF Champions League. When we went home the club’s executives started telling us that there were many teams that were following us and so we should keep on working hard. “Next thing we were told that Kaizer Chiefs wanted us and we had to go and sign for them. I don’t know about the other teams that wanted us because that was only known by executives. “I was very excited to (sign); I was really happy. I don’t think anyone would genuinely understand how happy I was to hear about Chiefs wanting to sign me . . . You need to be aware of where I started to understand what this move really means to me. “I was thrilled! I mean, who wouldn’t be happy to hear that Chiefs wants them? The deals were finalised a long time ago, but then we just decided to keep it to ourselves as per the instruction from the authorities. I signed a three-year deal and now it’s time to work’’. Chicken Inn had acquired Chirambadare at the beginning of last year from Tsholotsho, whom he had helped to promotion after arriving from an amateur club based in Gweru. Arriving at Chiefs along with Chirambadare is the hard-running Katsvairo — a product of the famous Aces Youth Academy which has already fed the ABSA Premiership PSL with Musona and Khama Billiat. Just like plenty of the domestic Premiership’s strikers, Katsvairo’s game revolves around an electrifying pace. His speed and the swerving shot on the run that he drilled home earlier this year against Sundowns in the Champions League all, but convinced Chiefs to take him on board. Katsvairo has been handed a jersey number 8 and his story is true testimony of what perseverance is all about. Prior to linking up with Chicken Inn, Katsvairo had been discarded by FC Platinum, who he had joined from Gunners where he won the championship. Joey Antipas, his former coach at Chicken Inn, who is now with the National First Division club AmaZulu, has described him as a fearless forward with an eye for goal. After excelling for the Gamecocks, Chirambadare and Katsvairo will be hoping to make an impact at the Soweto giants. But for Chirambadare he can afford to have some fun in the sun as he looks back to the dark days when he had traded his boots for the brown bottle which he had to serve to patrons.